Get tested & perfected recipes every week + a free eCookbook! Most egg salads are bland, mayo-laden affairs, but this one is vibrant, fresh and delicious! I think the simplest dishes are often the hardest to get right, and egg salad is a perfect example. Most egg salads are boring, bland, mayo-laden affairs. But when made properly, egg salad can be so delicious! For starters, it’s important to begin with properly cooked hard-boiled eggs; the whites should be tender and the yolks creamy. And then you have to really amp up the seasoning. Mayonnaise is a must for creaminess (and be sure to use a good one) but you also need a squeeze of lemon, a spoonful of Dijon mustard, and a few shakes of Worcestershire sauce to brighten the flavor. Celery and fresh parsley add crunch and color. And, finally, scallions add a lovely, subtle onion flavor. 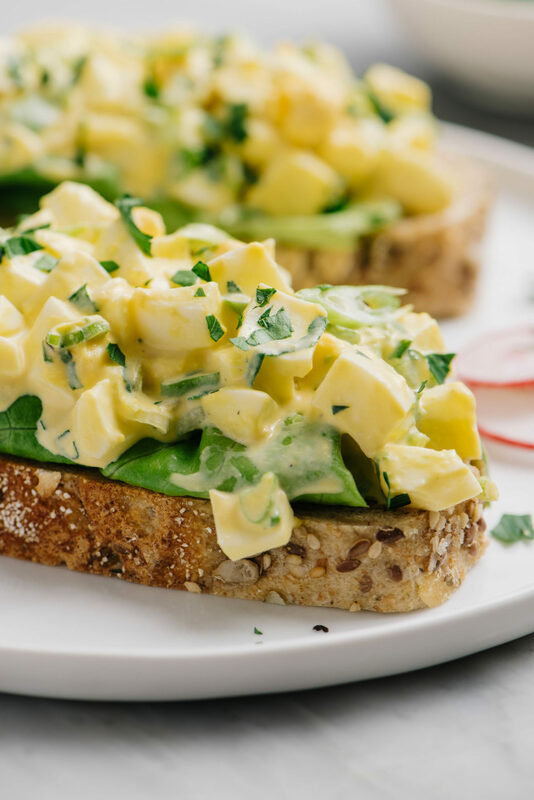 The result is a an egg salad that’s creamy and rich, yet also vibrant and fresh. Begin by hard boiling the eggs. Place the eggs in a saucepan in a single layer, and fill the pan with enough cold water so that it covers the eggs by about an inch. Bring to a rolling boil over high heat, then remove the pan from the heat, cover, and let stand for 10 minutes. Carefully pour out the hot water; place the pan in the sink and run cold water over the eggs until the pan is lukewarm, 1 to 2 minutes. Drain and refill with cold water; let stand until the eggs are room temperature, about 10 minutes. Gently crack the eggs all over and peel under running water. Then dry the eggs and chop into 1/4-inch pieces. Meanwhile, finely chop the herbs, celery, and scallions. In a medium bowl, whisk together the mayonnaise, mustard, lemon juice, Worcestershire sauce, salt, pepper, and sugar. Add the chopped eggs, celery, scallions, and parsley. Using a rubber spatula, fold to combine. Taste and adjust seasoning, if necessary, then serve or refrigerate until ready to use. If you refrigerate the egg salad, be sure to taste it again before serving and adjust the seasoning; I find the flavors mellow out a bit after some time in the fridge. For more boiled egg recipes, check out these posts: Sriracha Deviled Eggs, How To Make Soft-Boiled Eggs, Classic Deviled Eggs with Spring Herbs, and Spinach Salad with Warm Bacon Dressing. Place the eggs in a saucepan in a single layer, and fill the pan with enough cold water so that it covers the eggs by about an inch. Bring to a rolling boil over high heat, then remove the pan from the heat, cover, and let stand for 10 minutes. Carefully pour out the hot water; place the pan in the sink and run cold water over the eggs until the pan is lukewarm, 1 to 2 minutes. Drain and refill with cold water; let stand until the eggs are room temperature, about 10 minutes. Gently crack the eggs all over and peel under running water. Dry the eggs, then chop into 1/4-inch pieces. Make Ahead: The eggs can be cooked, peeled, and stored in an airtight container in the refrigerator 3 days ahead. If you keep the eggs in their shell, they can last for up to a week. The egg salad will keep well in a covered container in the fridge for about 3 days. Tip: When peeling an egg, start at the wider end -- there's usually a small air pocket in there, which makes the egg shell easier to remove. This website is written and produced for informational purposes only. I am not a certified nutritionist and the nutritional data on this site has not been evaluated or approved by a nutritionist or the Food and Drug Administration. Nutritional information is offered as a courtesy and should not be construed as a guarantee. The data is calculated through an online nutritional calculator, Edamam.com. Although I do my best to provide accurate nutritional information, these figures should be considered estimates only. Varying factors such as product types or brands purchased, natural fluctuations in fresh produce, and the way ingredients are processed change the effective nutritional information in any given recipe. Furthermore, different online calculators provide different results depending on their own nutrition fact sources and algorithms. To obtain the most accurate nutritional information in a given recipe, you should calculate the nutritional information with the actual ingredients used in your recipe, using your preferred nutrition calculator. Followed recipe exactly as written, but my yolks were still a little soft, are they suppose to be that way, and I had an extremely HARD TIME peeling the eggs despite following your directions precisely. An interesting play of flavors, but I prefer a more traditional egg salad. Hi Carol, The yolks should be just cooked through. You may have had very fresh eggs, which can be hard to peel. Can this recipe be doubled? I’m allergic to dijon. Could I substitute ordinary yellow hotdog mustard? Sure, Lesley – that’ll be fine. I have never been a fan of egg salad, because as you said, they are usually mayo laden and flat out boring. I made your recipe because I needed to use up some eggs and holy moley! This was flat out the BEST and most delicious recipe I have ever tasted for this simple, classic stand by! I didn’t change a thing because to me, I dislike reviews when someone has altered the ingredients and then complains about the outcome. I had enough to share with my neighbor and she raved about how yummy it was. I’m also going to add it to my tea sandwich collection for parties! Thank you, Jenn! I’d give it 10 stars if I could! Well done! I was skeptical about the amount of sauce for the amount of eggs and didn’t initially add any sugar BUT, BOY, was this delicious as written!!!! Fresh, not overly mayonnaise-y and just really hit the spot for us today. I had made my fresh baked whole grain bread and this was a superb accompaniment! So Good!! Love your recipes Jenn! Excellent, served on sourdough bread, used Boar’s Head Deli Mustard. Thank you. This is really good. I made it exactly as per the recipe and it was delicious. I made it a second time but added peeled and seeded cucumber and substituted equal parts of sour cream and cottage cheese for the mayo. Both my girlfriend and her mom said it was the best egg salad sandwich either of them ever had! I made it exactly as described above (accept for one thing, instead of sugar I put a spoonful of sweet pickle relish), It was delicious! Cooking eggs this way in Denver, CO results in egg whites that will be too soft! Impossible to peel! Just wasted 6 eggs…will try again using the 12 minute boil rule. Really want to try this recipe! Hi Carla, Yes, from what I understand the temperature at which water boils declines as elevation rises, so it takes a bit longer to cook hard-boiled eggs at higher altitudes. Wonderful! This was my first recipe to try off this site and it was delicious. Looking forward to trying more recipes! Delicious! I have never added Worcestershire to my egg salad but it is a nice addition. Thank you! This was a delicious recipe, thank you! I added pickle relish and left out the celery, scallions, and parsley because I didn’t have any on hand. I will try it next time! Delicious! So yummy. (I made it without the sugar). Yum I am going to try cucumber next time and maybe the cajun seasoning. I did add paprika. Is it good without green onion and that stuff? Hi Addie, the scallions, celery, and fresh herbs definitely give the egg salad a lot of flavor, but I think it would still be tasty without it. Very good recipe, I doubled the eggs to 12 and still had a nice taste. What a delicious sandwich this recipe makes! I used a pinch of monk fruit sugar instead of regular, otherwise following the ingredients exactly. Truly outstanding! Delicious. I thought I’d miss the pickles, but this version is wonderful. This was too harsh in flavors and too dry. I almost double the mayonnaise, 1/3 diced celery, salt, and pepper. Sometimes I use 1/2 tsp. yellow mustard. Don’t wreck a good thing. This recipe is amazing. I always want to spruce regular plain egg salad but never experiment and these flavors are a perfect combination. I have tried a few of your recipes and each one has been excellent. I look forward to trying more! Oh my goodness Jenn! Another home run recipe!! I haven’t made egg salad in years (because as you pointed out, it is typically very bland). This is not!! The dressing is so flavorful and the lemon juice gives it such a lovely zip, without being overpowering. I left out the Worcestershire sauce because I thought it might dominate the flavor. But this egg salad is so delicious, next time I will be more adventurous and add the Worcestershire. Thanks Jenn for expanding my repertoire!!! Best egg salad ever, hands down. Enjoyed on a warm baguette — delish! Can you substitute the mayo with sour cream because my husband is allergic to mayo? Hi Mary, I think that would work but because sour cream has a more tart taste than mayo, I’d suggest eliminating the lemon juice/white wine vinegar, to reduce the tart flavor a bit. Please LMK how it turns out with the sour cream! I am a cook. I am SUPER picky about recipes, a perfectionist. This recipe absolutely rules. Please make this. THIS IS THE BEST EGG SALAD I EVER MADE !!!! The. Best. Egg. Salad. Ever. As with all the recipes on your website, Jenn, this one is super. You’re my go-to girl. Could I ask where you got that bread. It looks amazing? Hi Lisa, I believe it was from Whole Foods – the multigrain. Love the egg salad recipe. I have found that a dollop (to taste) of a good horseradish sauce is fabulous with many mayo based dishes. It is essential in tartar sauce…also great in egg salad. Great recipe – always a winner. Just a tip on egg prep: try steaming them in a steamer for 13 min. Then plunge in cold water for 15 min. MUCH easier to peel…enjoy. Except for the sugar this is how I make my egg salad so I’m giving this recipe 5 stars because I know it’s delicious. Kind of cool when an excellent chef like Jen validates a recipe I’ve been using. Can you tell the nutrition informtation? Hi Lakshmi, I knew I forgot something when I posted this late last night! I’ve added it underneath the recipe. Hope that helps! This is very much the way I make mine too but I also add a tsp of horseradish….makes it very tasty…I do love your recipes! Once upon a time, I went to culinary school and worked in fancy restaurants. Now, I’m cooking for my family and sharing all my tested & perfected recipes with you here! Get tested & perfected recipes + my Top 10 recipes free! Or, text CHEF to 39000 to join. msg & data rates may apply. Text STOP to opt out. Curious? See a sample newsletter. Your information will never be used for any other purpose. Get tested & perfected recipes delivered to your inbox every week + a free eCookbook with my top 10 recipes!